Deus Ex Machina. Click through the image to read the full story. When I lived in LA, I always thought that Abbot Kinney was just about the coolest place there was in the city. It has that hip, laid back vibe that you’d expect to find in Los Angeles; though if you’ve ever actually visited Los Angeles, you’d realize that this relaxed, sunny, beachy hip way of life is actually not as all-pervasive as the postcards may have led you to believe. It’s in Venice, but it’s how you want Venice to be before you actually visit it; not the Venice Beach Boardwalk with its horrifying cast of grotesque characters and more tie-dyed shirts than you can shake a corn dog at, but something subtler, more charming, and just really LA. I mean, there are literally “Venetian” canals right nearby. You can’t get more quaint than that. Today, 7×7, a pretty awesome local magazine about life in San Francisco (which measures 7 miles by 7 miles, in case you were wondering where the title came from), ran an article about visiting the little Venice neighborhood from the viewpoint of a Northern Californian. Now, I must say, though I live up here, I am definitely a born and raised Southern Californian, so I can’t empathize much with the point of view, and to be perfectly honest, it’s been a couple of years since Venice was graced with my presence, but hopefully this provides a good starting point for anyone looking to visit the area. Even if their recommendations aren’t spot on, they at least got the Intelligentsia Coffee part right. My recommendation is to fuel up with a cup of that yummy stuff at their beautiful storefront and just start exploring. Everyone’s heard a story at some point in their life about a person who taught themselves to speak [insert foreign language here] by watching lots of television and movies in their target language. Especially for people learning American English, Hollywood productions and popular TV series can provide a window into American social and linguistic norms and practices that textbooks often can’t, even if it is a somewhat distorting window. We all know that watching The Help or Bridesmaids or Friends doesn’t provide the viewer with a flawless picture of how people live and communicate in America, now or in the past, but even exaggerated versions of American life on screen can provide insights into the things we as a country value and how we interact with one another. All in all, I am a strong believer that the benefits of watching movies far outweigh any risks that might be involved (like accidentally picking up Sylvester Stallone’s weird slur/drawl after watching Rambo one too many times or thinking that “E.T. phone home” is an appropriate, colloquial way to request use of a telephone). I watch Spanish-language movies as often as I can. While the Netflix Watch Instantly selection in this genre is quite disappointing, it still gives me instant access to way more movies than I had available to me before. Subtitles, for better or for worse, are turned on, with no option to be turned off. I’ve found that the DVD options they offer are much more complete, but I like my instant gratification so I’m sticking with the online rentals for the time being. One movie that I discovered through the service was a Mexican comedy called Casi Divas (Almost Divas). The plot (which at times takes on a vague-mockumentary-ish feel that I wish they had pursued further) centers around a nationwide casting call for a new movie based on a fictional telenovela called Maria Enamorada. With the telenovela’s leading lady growing too old to play the part in the movie (and not happy about it at all), the studio holds an open American Idol-style casting call, complete with acting competitions and telephone voting to find the new Maria. The movie follows four hopeful contestants from different parts of Mexico and very different walks of life as they compete for the starring role. This is not the type of movie I normally watch, but I have to confess, I love it. It’s in large part a very silly comedy, but there are very serious undertones that address a number of social issues of importance in modern Mexico. A rich contestant from Guadalajara struggles with her self-image and relies on her wealthy family to get her through the competition, another from Oaxaca is discriminated against because of her race (she is a Zapoteca Indian), another has a secret that could eliminate her from the competition (revealed halfway through the film), and one contestant from Ciudad Juárez hopes to use the fame she’d acquire by winning the competition to escape the murderous city she’s grown up in, and the numerous disappearances and killings that have plagued the city’s women for years. I do think the film glazes over many of these issues, but their mere presence as plot elements keeps the movie from being too fluffy and adds a little heart and soul to an otherwise lighthearted story line. This is a bit of a screwball comedy, a bit stereotypical, and it definitely focuses on the ladies (the male characters are not necessarily painted in the most flattering light), but overall I would highly recommend it. I don’t think it got the best reviews overall, but honestly, it’s enjoyable. If you want to read some more critical perspectives, NPR and The Los Angeles Times both gave it fairly favorable, though by no means rave reviews. Language-wise, there is a lot of fast talking, but there was clearly effort put into differentiating the characters’ different personal styles, and I think that comes through in a number of very distinctive speaking styles that are nice to see side by side. I’m not used to all the Mexican colloquialisms that appear throughout the film, but overall I think it’s a great vehicle for learning some new vocab and grammatical structures more commonly used south of the border. Don’t have Netflix? You can also get the DVD from Walmart for $5. Throughout this blog I’ve tried to address the many sides to travel, good bad and ugly, and I hope I’ve made a point of acknowledging that many of the best travel experiences you can have aren’t going to be 100% positive or smooth or easy (I hope I’ve also made clear that those experiences will almost always seem more positive, smoother, and easier (not to mention more glamorous) once they’re behind you). I am not going to say that I always travel to learn, to put myself outside of my comfort zone and experience new people and places, because often when I go on a trip my #1 objective is to have a good time and experience something new, nothing more (example: Oktoberfest!). But still, the more I travel, the more I am interested in forcing myself into situations that I know will be awkward or unnerving or completely alien to me, because those experiences always make the most powerful memories (examples: Albania! Couchsurfing!). Those experiences can also be the most helpful in bringing you face to face with your stereotypes and assumptions about different people and places. It’s easy to assume that you know about a place because you’ve read about it repeatedly in the news or because you make assumptions of what you would be like if you lived there. There’s nothing like seeing a country in real life or talking to real live humans with a completely different worldview than you to make you realize just how different some places are from what you know and are comfortable with–and how similar some things can be, even in the most distant corners of the globe. I haven’t been able to travel nearly as much as I’d like to in my life due to a lack of vacation time and money, but even getting a little bit beyond your border has the potential to expose you to things that you never knew existed. Looking at yourself and your country from a distance is a remarkably revelatory thing. But back to those restrictions of time and money. Those can be a problem if you’re hoping to broaden your horizons by zooming across continents to connect with foreign cultures. I get the opportunity to do that maybe once a year, and I must say I squandered my valuable cultural connection time last year on a Mexican beach resort and Oktoberfest….buuuut I will also say that those trips were totally worth their weight in vacation days and I don’t regret them at all! So 2011 was not my year for meaningful, enlightening travel. It was however, the year of the kindle. I will wax poetic on the many wonderful features of my kindle at a later time, but let’s just say that it has allowed me to get a lot more reading in, and there were a number of books that I read over the past year that allowed me to travel vicariously through their narratives and characters to some of those exotic locales that I missed in 2011. 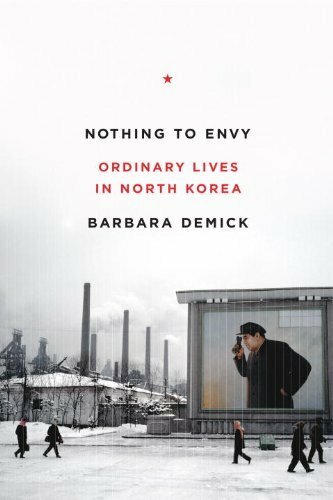 One of the more exotic (or less, depending on how you define exotic) locations to which I decided to pay a literary visit was North Korea, via Barbara Demick’s non-fictional Nothing to Envy. I’ve always wondered about North Korea, mainly because the place seems SO DAMN WEIRD. How can a country be so backward, especially when surrounded by some of the most quickly advancing societies in the world? How can one leader be so controlling? How can people who are clearly being wronged be so devoted to such a strange little man? How can the entire country just seem so crazy? I feel like most accounts of North Korea come from a very American perspective, or maybe more accurately a very non-North Korean perspective. Coming from a place as open as the States, it’s hard to imagine the kind of control that a truly dictatorial, completely closed government can exert on its people. It’s hard to imagine all the things that we take for granted in a wealthy, capitalist society, and it’s especially hard to imagine what it would be like if all of our sources of information were cut off and controlled by a government that only wanted us to see, learn, and experience certain things. Accounts of the country typically focus on the eccentricities of the recently departed Kim Jong-il or the absolutely ridiculous (but admittedly amazing) performances of the Arirang Festival. What’s refreshing about Demick’s book is that it tells the story of North Korea from a new perspective, from the point of view of ordinary North Koreans. These people weren’t all party members, didn’t all live in Pyongyang, and they weren’t groomed by the regime to tell a certain story. The result is a collection of sincere, captivating stories of normal lives in a decidedly abnormal place. The six stories woven together by Demick together create a rather compelling narrative that I really couldn’t put down. It lacks some of the elements of your typical page-turner, but the stories are so revealing of what life is like above the DMZ, and the topic so typically unexplored, that I plowed through the book, emerging with a new fascination for North Korea. The passing of Kim Jong-il a few weeks back makes this book rather timely and even more interesting. I highly recommend it for anyone looking to broaden their horizons on an empty wallet. And for those of you looking for a bit more information on North Korean, check out the following photo essays on life in the country. I am starting to put together a little map of some of the places I enjoyed in Madrid. Here’s the first bit! Note: For some reason the map isn’t centered, so click on it to see everything! Backpacks at the Blue Eye, originally uploaded by jhoolko. When I found out I was going to be living in a relatively boring town surrounded by lots of other NOT boring places in southern Spain for nine months, I decided it would be a good idea to buy a backpack so I could get the hell out of my town on the weekends and explore. I had a small daypack that I had used during other short-term travel (A North Face pack similar to the Recon), but I wanted the possibility of doing some more intense travel and that baby just wasn’t going to cut it. So I logged onto REI and started shopping. I am a picky shopper, especially when it comes to spending loads of hard-earned money on something as boring as a backpack, so I did my research. I wanted something that could get me through a month-long trip or a two-day trip. I wanted something that would fit into the overhead compartment of a Ryanair plane, I wanted something with lots of convenient little pockets, and most of all I wanted something that would be comfortable. I have a weak, finicky back, and backpacks usually are not something I look forward to putting on, so being light and ergonomic and having some form of a supportive frame were all requirements this bag would have to meet. And I wanted all of this for less than $200. My research led me to a fancy new superlight pack by Osprey; the Exos. The Exos is like a feather. It also has a lot of cool features like easily accessible trekking pole loops, a sleeve for up to three liters of hydration, and a bunch of other stuff that I will probably never use. Half of the cool gizmos and gadgets on this thing actually almost scared me away at first. I was planning on daytripping through Andalucía, not trekking through the snowy Himalayas. I didn’t need poles or hydration systems, I needed a place to put my laptop, a couple shirts and my camera in a way that wouldn’t give me a backache. And I found it! After a one-on-one session with an unfortunate REI employee who was subjected to intense questioning and a try-on session that involved maybe dozens of backpacks filled with dozens and DOZENS of beanbag weights, I was hooked on the Exos. It was super light, and the suspension system kept the pack off my back without keeping it too far off my back so I never felt like I was falling backwards. The straps didn’t cut into me anywhere, the frame hugged my body, and the capacity of the 46 liter model was plenty big to last me for just about any length European backpacking trip without tempting me to pack too much (though there is a larger model Exos out there if you need that extra capacity). The 46 liter pack was $179, and it was quite possibly the best $179 I have ever spent. My boyfriend settled for the slightly more heavy-duty, slightly bigger, slightly less-pricey Atmos (the green pack in the pictures) which I will touch on as well. 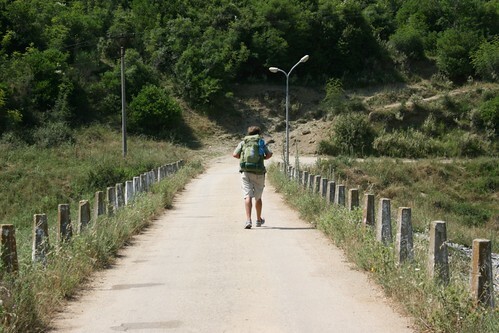 I backpacked through Spain for a month in September 2009, then lived out of the backpack every Mon-Thurs from October until March of the same year. In December I took a winter trip to Poland and the Czech Republic with the thing, and most recently in June I spent 10 days backpacking in Albania and two in Italy. Throughout the year I took a bunch of side trips to places all around Spain, by plane, train, and bus. The backpack has been thoroughly tested, and I am happy to say that it is amazing. First of all it is light. This is great. If you are going away for a day or two, you don’t even feel like you have anything on your back, and the bag compacts down enough that I would even consider using it as a daypack if I didn’t have another bag available, which I don’t. 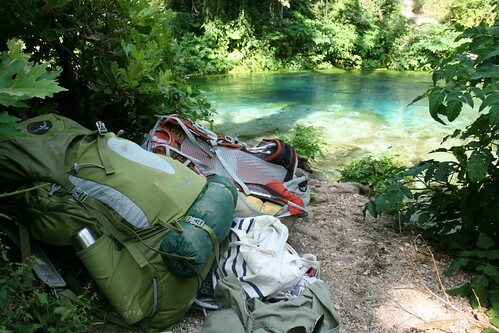 If you are going away longer, the lightness can be essential in situations like hiking down a cliff in the dark to camp on an Albanian beach or when you are being ordered by an Italian airport security officer to repack your bag to get it under the ridiculously strict 10 kilo Ryanair hand-luggage restriction. On the downside, the pack is only so light because everything on it is a little smaller, a little thinner, or a little more hollow than a normal pack. At first I was worried about tossing it around or checking it on a flight where it might get banged up, but after a few months I realized that it was tough enough to take some bumping about. The only thing that really bothers me about the lightness is the waist belt. The belt itself is very thin compared to the Atmos or other similar packs, which means it can cut into you a bit if the bag is particularly heavy. The clips also sometimes pop out or get loose due to the fact that they just don’t have the bulk of a normal bag. This bothered me a bit but it was worth it because the rest of the pack was so great, though I could imagine it being a little more bothersome if you are doing more serious trekking. Otherwise, the pockets and straps and everything are wonderful. You can fit so much stuff into that 46 liter pouch that you could easily travel for months. Even when carrying a sleeping bag, a tent, my DSLR, and clothes for two weeks in there, we were still able to get the bags through Ryanair as carry-ons without a problem. 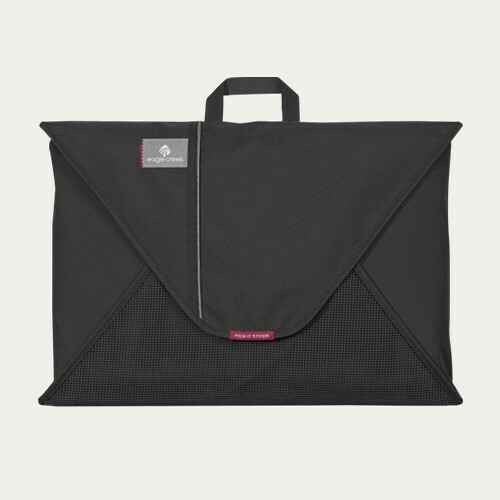 The soft stretchy pouch in the front is great for shoes, wet clothes, or anything you might want at hand, provided that there are no sharp edges involved. I have a few little cuts in the stretchy front pouch material from things as soft as a book, so be careful before putting anything with corners or points in there. The front pouch below the stretchy pocket has zipper access running down the left side of the pack and is great and huge, though not always 100% easy to get your hand into when the main compartment is filled, partly because it is so large and smaller items can get lost in the folds of the pocket. I rarely left loose items in there, instead grouping them into zipper bags to make them easier to pull out. Having a shallower zipper pocket in the front area might have been nice, and the Atmos does separate that front section into two smaller pockets which sometimes made me a little jealous. The water bottle holders on the sides are roomy and easy to access while wearing the pack, and there is enough netting and straps that you can easily keep lots of things in there besides a water bottle without worrying about anything falling out. The compression straps on the side, though thin, are excellent at compacting everything down to a manageable size. The mesh pockets on the waistbelt are big enough to hold things like small change, chapstick, a digital camera, passport, etc, which was always convenient while walking longer distances or at the airport. The cell phone holder on the shoulder strap came in handy often, and the removable pouch on the top of the bag was in constant use and smooshes down nicely when empty, though I often found myself wishing it was waterproof to provide some coverage for the rest of the pack. The shoulder straps in general could be a little thicker and more padded, but honestly if you are going to be carrying so much weight that the straps are causing you pain, an ultra-light bag probably isn’t a good choice for you. And lastly, the colors are a super cool grey and burnt orange which I swear had nothing to do with me picking it…. So the jist of this all is that the Exos is an excellent pack for backpacking, if by “backpacking” you mean through Europe or something similar. I assume that it will be just as good out in the woods or wilderness or whatever, but I can certainly give it an A+ for the budget traveler set, if you can recommend a $179 pack and still be using the word “budget.” It easily transitioned from walking the streets of Milan into camping in Albania and it looked good doing it! And if the Exos is just too light or delicate or whatever for you, the Atmos offers basically everything that the Exos does, but is a little heavier (emphasis on little), a little more sturdy, and a little cheaper–an excellent alternative. For my boyfriend, the Atmos just felt better on his back, and he decided that ultimately comfort was worth an extra pound or so of weight, and it was a great choice for him. Either way, both packs have proved to be well worth the investment. I highly recommend doing a fitting at REI or a similar store where you can try on the different sizes, talk to a salesperson, and even add lots of weights to make sure nothing pokes you in the wrong places, which is definitely something you want to look into before purchasing the pack, loading it up with 30lbs of (absolutely necessary) supplies and hitting the road. I think that one of the most prevalent and difficult-to-defend-against stereotypes about the U.S. is that we all eat greasy, disgusting, fattening, butter-smothered crap fast food for every meal in portions large enough to kill a normal healthy European, Asian, African, bear, elephant, alien, etc. When asked about typical American food, the first response is always hamburger/McDonalds, then french fries, hot dog, then people start getting into food which some defend as food of other countries (Pizza, Mac and Cheese: people go crazy about these two being Italian), and then they start talking about eating an entire turkey, as if we each sit down every night and personally consume the corpse of an enormous bird. Then inevitably breakfast comes up where people are shocked and alarmed at the idea of eating anything other than toast and coffee before 2pm, and then they just start naming off unhealthy foods that they saw once on some TV show about how horrible Americans are. Now, while this offends me as a reasonably healthy eater and someone who hasn’t eaten McDonalds anywhere outside of EUROPE in a number of years, after many years of consideration, I think that the stereotype is misguided but in essence totally true. I also blame “American” restaurants abroad for about 70% of this stereotype. Also I am currently craving Roscoe’s Chicken and Waffles so I guess I also have myself to blame a little bit. This particular specimen was collected and consumed at La Cuchara de San Telmo, a fantastic pintxos bar in San Sebastian with one of the worst websites I have ever seen. Anyways, it was accompanied by a nice little pool of some kind of apple preserve (basically fancy European apple sauce), some sea salt, and a nice little swirl of obligatory extra virgin olive oil. And oh my god. I will try my best to explain foie to the uninitiated because before this trip, I thought that it was just paté from happier ducks/geese. NOPE! 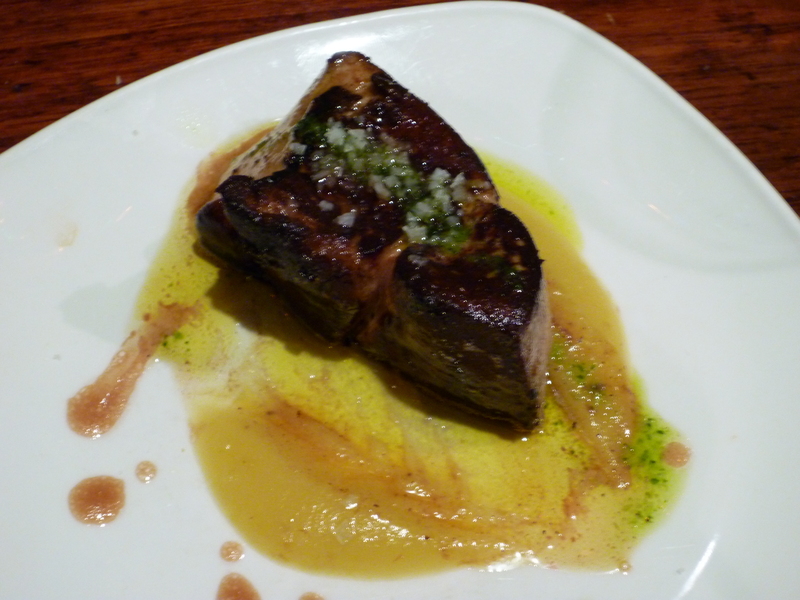 Foie gras comes in a variety of levels of quality, ranging from the kind you get in a can that is only a certain percentage of force-fed duck or goose liver, to the really really awesome stuff which is literally just a liver of a duck or goose that has been fattened via tube feeding its entire life. Poor duck/goose, I know; but lucky me. I would never eat liver in the U.S. just because I imagine 7th grade biology and all the fun images that might conjure up for any person, and also because any paté I’ve ever tried before this trip (even paté of foie gras) just kiiiinda tastes like cat food to me. BUT THIS. This is different. Imagine the most succulent, flavorful, sinful piece of food you have ever eaten, then stick it on a grill to get the edges a little crispy, then put it and all its delicious juices into a pool of subtly sweet apple compote and eat it with some nice bread. I’ve also tried the fois-on-toast iteration at a tiny little tapas bar in Chueca here in Madrid, and honestly…just as good. Just as incredibly, incredibly, good. But, the point of all this is, it’s not healthy. At all. I mean this is the opposite of healthy for you, for the duck with the tube down its throat, just for everyone involved. But I mean look at that thing! What you may not be able to tell from the picture is that it’s small. That plate is the size of the plate you’d get your dinner roll on and the foie itself is the size of a meaty little cell phone (I apologize to the world for not being able to think of a better comparison). It’s bad for you–it’s oh so bad for you–but it’s small and genuinely totally enjoyable. I savored every last bit of that thing, even towards the end when I was starting to think about it too much and get creeped out. And that is what makes the bad foods here different from the bad foods I am used to. The bad foods here are really good. I still think it’s unfair to generalize about the evils of the American diet versus the virtues of the Mediterranean/European, but I think I can really see why Europeans will so genuinely defend their eating habits as being so much healthier than Americans’, even with a caña and plate of deep fried fish in hand. They eat to enjoy, to pass time with friends, to have something to do for hours and hours and hours. We eat to eat, to get energy in, to satisfy a craving, whatever, but rarely do I see people sitting for three hours at a restaurant in the U.S. without getting dirty looks from the entire waitstaff. 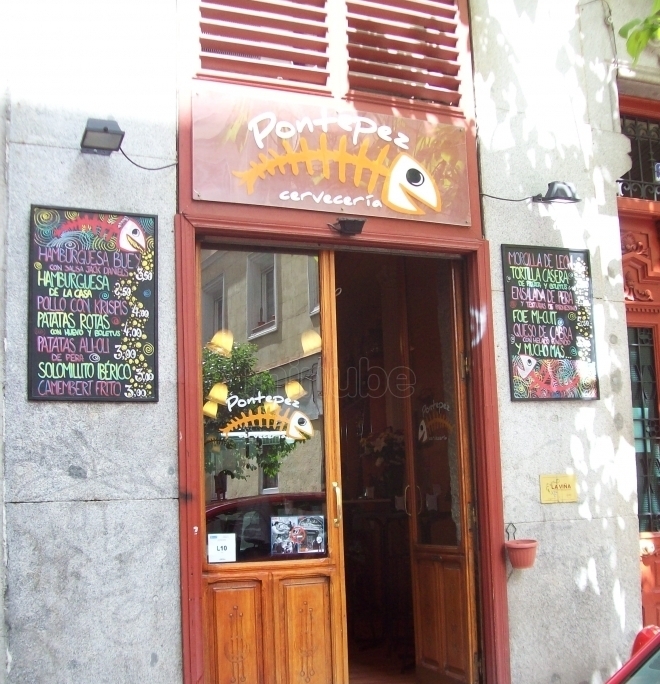 I have been to this little bar in Malasaña about five times. Let me remind you that I have only been in Madrid for about a month. I don’t know what it is about this place, but I just keep coming back! Ok, I lie, I do know exactly why I keep coming back. Pollo con Krispies. I am hooked. It’s a three euro plate of chicken, coated in corn flakes, fried, smothered in mustardy curry sauce, and SERVED WITH A SIDE OF ICE CREAM. Coconut curry ice cream. On a bed of sprouts. Just trust me and try it. And while you’re at it, try everything on the menu except for the pear salad (parmesean ice cream just doesn’t work in salad) or the frogs legs (taste like fish, look like humans). Their whole deal is having really weird, bizarre seasonal tapas, and even though there are some misses, most of the time it works. Do it!